I had a friend, Michael. We’d played music together in a local band, but by day he was a camera-person at a Vancouver TV station. He’d gotten a Mac early in 1984, pretty much as soon as they became available in Canada. He’d demo’ed it to me, and while I thought it was pretty neat, it wasn’t something I thought I needed. I had two young children – one born almost the same time as the Mac, in January 1984. With my wife not working, we didn’t have a lot of extra cash. A few years later, though, I was working as a teacher, and I’d concluded computers were going to be coming into classrooms in increasing numbers and I should probably familiarize myself with them. Michael’s photographer friend Josh had a 128K Mac to spare, so I rented it from him for the summer. Let’s think back to that era, if we can. Hard drives were not yet common – the Mac Plus was released in January 1986 with a SCSI interface, giving Macs a standard way to add hard drives. But even then, they were expensive. This Mac, instead, used two floppy diskette drives – one internal, the second one in an external box. The 3 1/2” floppy diskettes were single-sided and stored 400 kilobytes (KB) of data. You could have a bootable floppy with a couple of small programs – maybe MacWrite and MacPaint on one diskette – and use the second drive for a diskette to hold your saved data files. That worked pretty well. The problem arose if you wanted to run a larger application – one that needed a diskette of its own. Maybe the page layout program Ready, Set, Go. Or an early version of Microsoft Word or Microsoft’s Multiplan spreadsheet. In that case, you could have an operating system diskette in one drive and the program diskette in the other. The problem arose when it was time to open or save a document. Then you’d need a third diskette – but you only had two diskette drives. You could pop one of the diskettes out of the drive without dragging it to the Trash and ejecting it. 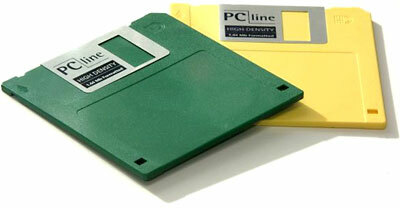 When you did that, the diskette’s icon remained on the desktop; it was still mounted. You could then insert your data diskette into the empty drive. All well and good. 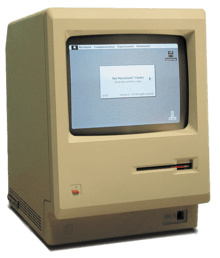 But to save (or load) a data file from an application, the Mac needed to make use of the operating system diskette, the application, and your data diskette. With only 128 KB of memory, it could only store a small amount of what it needed in RAM and needed to frequently read from the floppy diskettes. 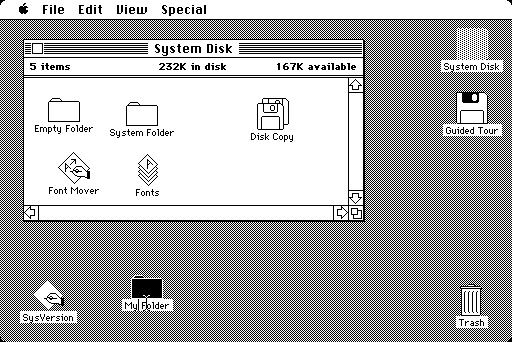 So with your application running, you click File/Save and point to your data diskette. The Mac buzzes, locates your data diskette, then pops it out and ask you to insert your program diskette. You do that, it buzzes for a moment – reading a bit of the application – then pops that diskette out and asks you to insert your data diskette. Write a bit of data. Pop out the diskette, asks for the program diskette. Buzz, read, pop. Insert. Repeat. And repeat. And repeat. In some cases, as many as dozen diskette swaps. Soon after the Mac was released, people started upgrading the RAM to 512 KB, informally creating a Fat Mac. Apple released Macs with 512 KB memory in September 1984. The 1986 Mac Plus could support up to 4 MB of memory. With more memory, the Mac could remember bigger chunks of data at a time, reducing the amount of times it needed to read what was stored on a diskette. But that summer with my rented original Mac remains in my memory as the summer I spent doing the Diskette Shuffle.